I sliced an English cucumber, red onion, and chopped up fresh dill. I added a splash of white vinegar, sugar, and a pinch of salt. I stirred the ingredients together and we were ready to eat. I love easy salads like this one. Josh made vegetable hummus sandwiches to go with the salad. We had a fresh, summer meal in a matter of minutes. The cucumbers are crisp, crunchy, and refreshing. The dill, red onion, and creamy feta cheese make this salad pop with flavor and color. 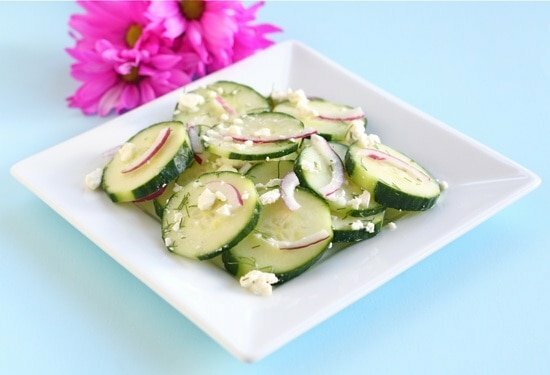 This cucumber feta salad is the perfect side dish for any summer meal. Go grab a cucumber from your garden and make it today. We also have an Atheno’s Feta Giveaway-to enter visit our Giveaway page! Giveaway ends on Sunday, July 18th. Don’t miss a post, subscribe to Two Peas and Their Pod today! 1. 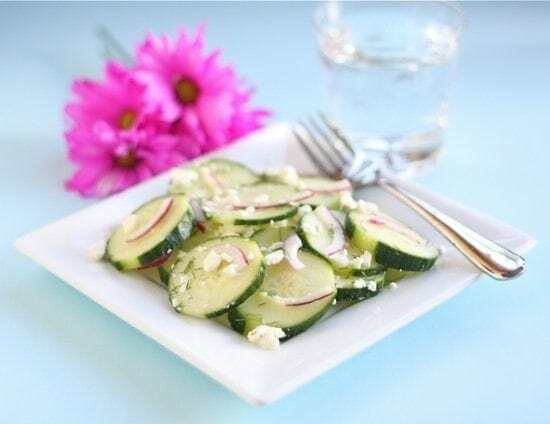 In a small bowl, combine the cucumber slices, red onion slices, vinegar, sugar, and salt. Stir to combine. 2. Add in chopped dill and feta cheese. Stir again. I love red onion in salad, it’s the bomb! Cucumbers are one of my all time favorites too, looks simple and delish! Simple, fresh flavors and gorgeous presentation. It doesn’t get much better! I hope the remodel is going well! My mom makes something similar, but adds tomatoes. It is one of my most favorite summer salads. Light, delicious. Yum Yum. That is a lovely looking salad, Maria! I have a container of cukes sitting in some rice wine vinegar in the fridge as we speak. Love the simplicity of this salad with the feta and red onions. Sounds like the perfect summer meal! This looks beautiful and perfect for summer! Wow, I did something so similar yesterday for lunch. I used cukes, tomato, balsamic vinegar, feta, sea salt, cracked black pepper. I’m going to have to try this now too. That looks so good! I’m going to have to try this one and the Strawberry Balsamic one!! Now I have a way to use the 12 cucumbers I pulled from the garden last night. Thanks! This looks so refreshing! I haven’t made anything with dill in a while. Definitely going to give this a try soon. My neighbor is growing cucumbers. Love it when something so simple tastes so great. This is proof that good eats don’t have to be stuffy. okay I’m off to buy feta. My kids love these combinations that you have been posting-all of their favorite ingredients! Either of the words “cucumber” or “feta” would have definitely caught my attention. But both together? I’m totally smitten with this recipe. What a great combination of flavors for a simple, easy, and refreshing summer salad. What a refreshingly light salad! I’m always impressed by your healthful creations. That looks really good! I will be making this for lunch! Just what I need on these hot summer days! I love meals like this. Simple, fresh, and delicious! I love this type of salad. Light and simple meals are the way to go in this hot weather. So pretty and simple! Love these kinds of recipes!! A perfect summer meal! Yum! Feta? That’s genius! I’ve been making something this without feta forever and I never thought about what a perfect fit it would be to include it. Thanks! PERFECT! I love salads like this, and that veggie hummus sandwich sounds great. I may replicate this exact dinner tomorrow night! 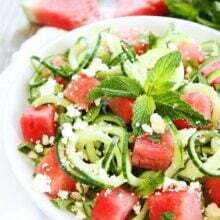 What a refreshing salad that is so perfect for summer! Lovely salad. The second photo is excellent. 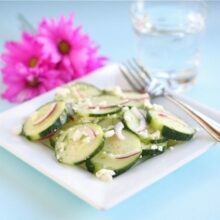 Cucumber, red onion and feta is one of my favorite combinations! I love getting this type of salad at a middle eastern restaurant we order gyros from. Delicious! This looks great! I need to try it! This is such a light, pretty salad. It just goes to show that you don’t need to spend hours to make a healthy, tasty dish. 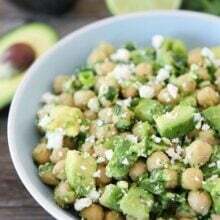 I love that you’ve posted light, healthy & fast recipes! I just wish our cucumber plants hadn’t been eaten by a pack of snails. Boo. To the store I go! Thanks for the shout-out! 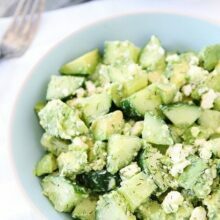 I this cucumber feta salad– the combination of all of the things I want to eat for a refreshing summer meal. I’m so happy you came over to introduce yourself– your blog is lovely and I look forward to checking it out! What a perfect summer salad! Looks so fresh and delicious… Great job! This looks like a great salad for summer! Love the flavors. Looks yummy and refreshing. Thanks for posting! So simple and healthy! Will be perfect for the hot summer days ahead! If you’re a web content writer and constantly wondering what are people searching for on Google, then What The Auto-Fill is for you. At Works For Me Wednesday bloggers link up their posts featuring helpful tips that “work for them”. My aunt just brought over a salad like this for our Father’s day dinner and it was amazing!!! She also had cherry tomatoes and balsamic vinegar. That feta cheese, though! Man, it tastes good!